Figs can be eaten either fresh or dried. Drying figs can be a way of preserving its sweetness and through drying, figs can be stored for months and years. There are three ways of preserving figs through drying, which can be done in the convenience of our home. Wash the fully ripe figs with tap water. You have to ensure that the fruit is free from dirt and other debris before drying it. Dry the figs with a dishcloth or paper towels. Make sure it is not damp. Cut the figs in half. You can use a kitchen knife to do this. You have to cut the figs this way so it will dry quickly and efficiently. Cutting figs in half makes sure that no juice will remain in the center after drying. Prepare a wooden rack or a wire rack by putting cheesecloth on top of it. A wooden rack or wire rack is better than pans with solid surfaces because it allows air to flow through, which gives better results if drying is your goal. Lay the halved figs in the wooden rack or in the wire rack. Cover the figs once again with cheesecloth. You will need to tuck the cloth into the rack to fully protect them from insects during drying. Put the rack with the figs into direct sunlight. You may need to do this for two to three days (2 to 3 days), turning it over on its side every time you put it out, to ensure you can dry it evenly. Make sure also that there is enough amount of sunlight and that you won’t put your figs in the shade because the figs might end up spoiled before they even got dried. Bring your figs inside before night time to ensure they won’t be wet with dew. Another way of drying figs in direct sunlight is by hanging it using skewers or tying it in the clothesline. Pat it with paper towels to dry. Cut the figs into half. Cut pieces of cheesecloth enough to wrap an individual fig fruit. Cut a net bag also with a size big enough for the fig fruit to be placed. The cheesecloth and the net bag protect the fruit from insect and other contaminants during the process of drying. Wrap a slice of fig in a cheesecloth. Then wrap it again in a net bag. It is best that the halved figs be put inside the cloth with their back against each other, so the flesh of the fruit will be exposed to the sun and dried quickly. Hang each fruit with skewers or tie it in clothes exposed to sunlight. You will need to do these in two to three days. Avoid shade as this may spoil the fruit before drying it. Check if the fruit has the leathery feel already and no juice is found in it. This is your way of measuring if the fruit is dried efficiently. To store, put it in an airtight container. Then store in the fridge or freezer. Preheat your oven in the fruit setting or around 140 F or 60 C. The low temperature of the oven will ensure the even drying of the fruit. Wash figs with tap water to cleanse it from dirt. Pat it with paper towels or dish cloth to dry. Cut the fruit into half. Put them in the oven wire rack with the cut-face-up. Put the figs in the oven for almost a day and a half or 36 hours. In this span of time, you have to turn the fruit on the other side for drying evenly from time to time. Let the figs cool first and then store in an airtight container. Put in fridge or in Freezer. If placed in the freezer, dried figs can stay up to a couple of years and still preserve its sweetness. Turn the dehydrator to 135 C or fruit setting. Wash the figs with tap water to clean it. Put them in the dehydrator rack with the cut side up and let them remain for 8 hours. Check from time to time and turn on the other side for even drying. 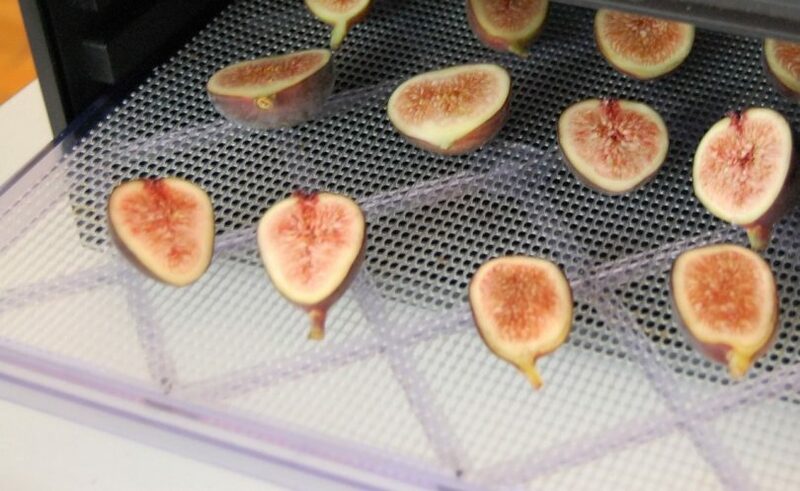 A longer time of dehydrating may be needed in cold areas or with figs of bigger sizes. After 8 hours, check if figs are supple and chewy. If they are, it means they are dried. Let figs stand on the tray for some time to cool. To store, place dried figs in an airtight container. Store in the refrigerator or freezer, you can keep them there even after several months. Make sure that you really dried the figs well so they can be kept even after months of storage. Ensuring the cleanliness and the best conditions of airtight containers are also an important aspect of drying. Check if there are holes in airtight plastic bags and that there is no moisture inside when packing. And remember that while figs can be preserved for months, it is still best to consume them as soon as possible.